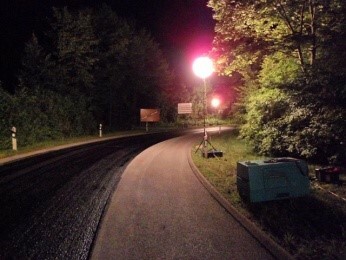 Our lighting service satisfies all the requirements related to night work; it complies with the regulations in force and in particular with the requirements of the Labour Code (Article 3-17) and especially with the recommendations published by the OPPBTP for the temporary electrical installation for work site lighting (safety sheet G1 F0289). PLEINE LUNE is also ISO 9001-2015 certified. 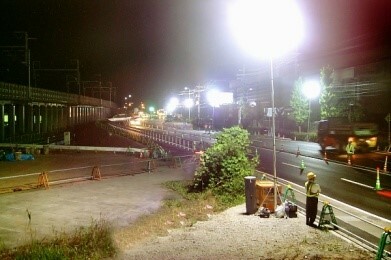 Lighting work sites using the luminous balloon lights invented by LumiAir (the parent company of PLEINE MOON LOCATION) is particularly suitable for night work. The diffracting quality of the fabric they are made from makes LumiAir balloons glare-free. The balloons reduce the visual fatigue of operators, allowing them to work in good conditions with minimal inconvenience when carrying out their tasks, and with increased productivity. 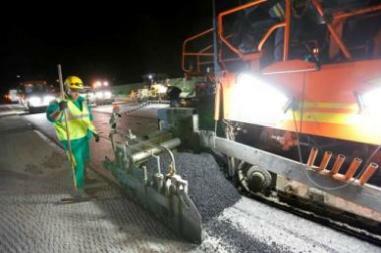 In addition, people driving near the site are not dazzled and can therefore pass the work zone without increasing the risk of accidents. It should also be noted that the excellent optical quality of the multilayer fabric used on LumiAir balloons, combined with the use of high-efficiency discharge lamps, allows for significant illumination levels of work areas. All our balloon lights are equipped with an immediate hot restart system, allowing the lamp to be restarted immediately in case of power failure. 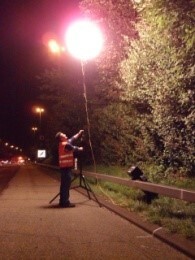 However, the safety of the personnel working on the site and of the emergency response services can be further enhanced by positioning our balloon lights equipped with LED emergency lighting (30 minutes' operating life) at strategic locations (work site entrances, exits...) allowing the safe evacuation of personnel in the event of an incident or at the end of the assistance provided. These balloons, which automatically switch to emergency mode in case of power failure, give a clear view of accesses to emergency exits and provide good readability of safety instructions. Lors de la mise en place et l’installation, nos techniciens positionnent les ballons en poste fixe sur mât télescopique et/ou directement embarqués sur During positioning and installation, our technicians place the balloons in a stationary location on a telescopic mast and/or directly on your road construction vehicles. They then ensure the supervision and maintenance of the equipment for the entire duration of the work site so that the site's lighting requirements are met (they have about 20% of equipment in addition to the order to meet any extra one-off needs). 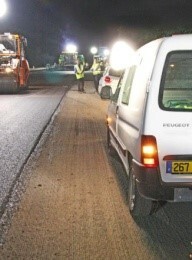 During night work, PLEINE LUNE expertise, acquired since 1994 on the roads of France, makes it possible to judiciously position the various LumiAir lighting and signalling systems in a stationary location or on vehicles and to provide lighting that is adapted to different layouts of the site and the type of work to be performed but also to ensure the safety of all the people present on site. 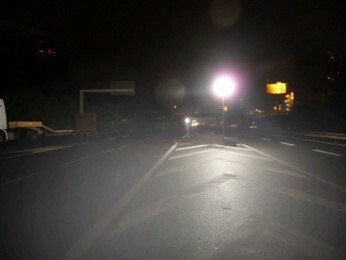 Visible from far off by motorists and glare-free, the LumiAir balloon lights set up by PLEINE MOON are particularly suitable for lighting lane-switches and lane-closing and other modifications to night traffic. 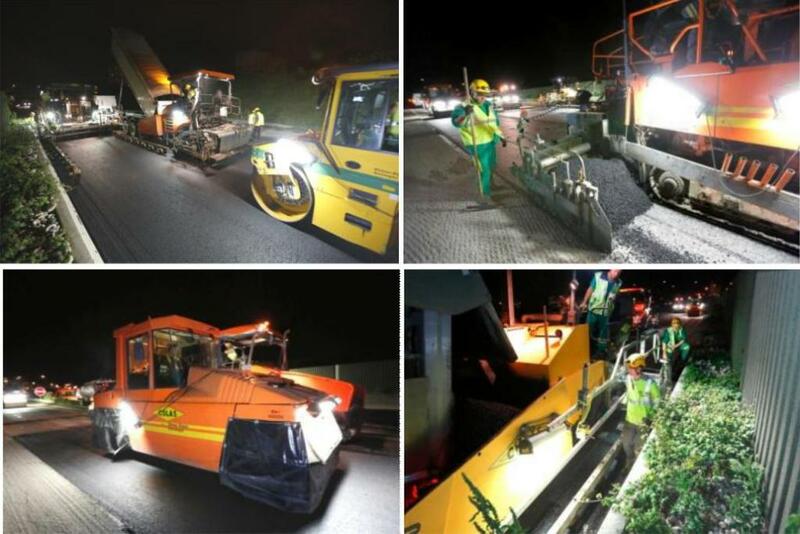 In addition, given the many comings and goings of trucks and machinery during the screeding and asphalt paving phases, the vehicles present on the site must be visible to all. Positioned on the roof of stationary and/or moving vehicles, the Light Diamond meets these safety requirements. 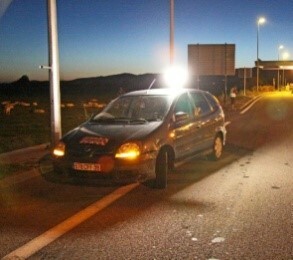 Use of Light Diamond on Emergency vehicles. 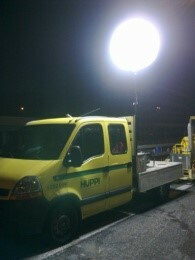 Vehicle equipment present on site with balloon lighting. Our LumiLed box, positioned every 100 to 150m ensures that drivers have a light guidance (3 blue LEDs). Delivered with a battery pack that has a very long operating life (thus avoiding lengthy daily recharging). During the approach and centring phases with the earthwork machinery (screeds and pavers) our magnetic tricolour miniLumitube, fixed directly on the machinery receiving the dump trucks, allows not only a precise identification by the trucks but also provides visual communication between the machinery operators and truck drivers (sending orders such as reverse, stop, raise/lower skip, leave... by radio remote control). This lighting communication system is also particularly useful when working in urban areas to reduce noise pollution related to the use of horns. 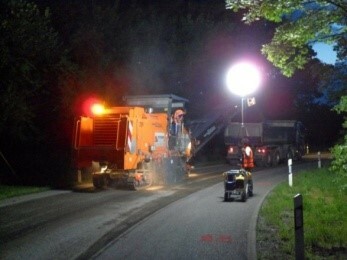 Given the many participants during the screeding (trucks, screeds, sweepers, inspection and collection operators...) the balloons are not mounted on the machinery but positioned in a fixed location with their generators on the edge of the roadway undergoing work (at intervals of 50m, 80m or 100m according to the models). Depending on the site configuration, the balloons are installed either on the side of the emergency-stopping-lane or the median strip; the masts are mounted on a tripod, fixed on metal/concrete safety barriers or fixed to the generator set. It is also possible to use our mobile LumiKart stand-alone systems and move them along the work site as the project progresses. Glare-free illumination of the work zone. Balloon in a fixed location on the edge of the roadworks. Mobile LumiKart along the work site. All LumiAir balloons are equipped with double-decker anti-vibration protection allowing the assembly and the use on all types of rolling machinery (finishers, screeds, compactors...). 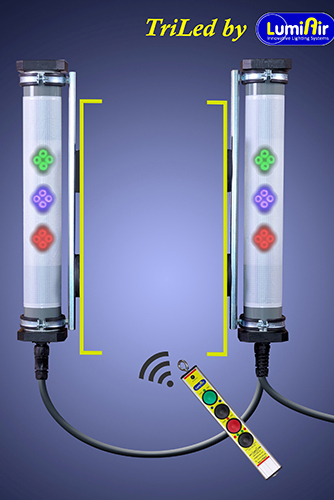 The balloon lights connect directly to the machine sockets (regulated 230V 50 / 60Hz) or to the generator set on the vehicles' nacelles. 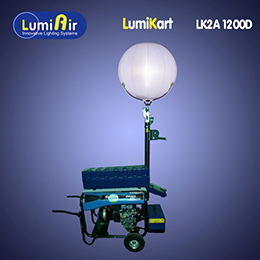 Equipped with the patented LumiAir hot start system, the balloons set up by PLEINE LUNE do not require any waiting time for the lamps to be restarted in the event of a power failure. The discharge lamps used in our balloons not only provide a significant amount of light for the work area but also limit eye-strain thanks to the glare-free covering and the daylight colour used, and facilitate work flow by increasing efficiency. Some examples of balloon lighting mounted on machinery. Other possibilities of lighting work areas. During certain delicate or special operations (working right next to safety barriers, building joint work...), it is necessary to have versatile and easy-to-implement additional lighting of the work area. Thanks to its rigid covering and 2 anti-slip magnets, our LumiTube fulfils this function perfectly and allows complete lighting of the work area. Power supply from the machine sockets or a small low-noise generator set on a support designed by Pleine Lune). Fixing of the LumiTube on vehicles using anti-slip magnets - fall prevention using tensioners. Many related operations are organised around the site (marking, measuring, tracing lines, laboratory control, coring, repairing, sealing...). The volumetric lighting provided by the PLEINE LUNE balloons makes it possible to illuminate the whole area around the machinery and thus to increase the safety of the operators working close to them. 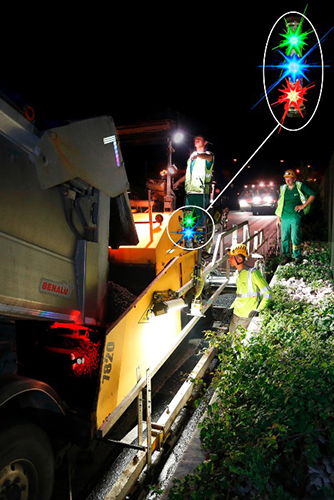 These operations, sometimes carried out at far from the centre of the building site, require means of independent lighting that can be provided by our battery-operated light diamonds or our stand-alone mobile lighting units (LumiKart trolley or LumiTrail trailer). The quality of the light and the power of the sources make it an indispensable tool for night work of any kind. 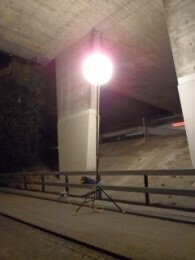 Easy to install and uninstall, balloon lights are the latest equipment on the work site and allow the final operations to proceed safely before reopening to traffic. Easy assembly and easy disassembly. On-board on all types of vehicles. Mobile autonomous trolley for remote work. After the authorisation for site opening: installation of balloon lights on their telescopic supports moored to the generator-set in its holding tank against possible risks, provided with their absorbing felts (our generators do not require earthing, see attached document). Installation of a balloon light placed on its telescopic tripod, its generator-set placed in its holding tank against possible risks, provided with their absorbing felts. With the help of an easily movable mobile trolley, a balloon light with its protection will be installed at the point requested by the works manager. On request, the balloon covering may be red for a clearer visual indication of the particular point. A- Installation of balloon lighting on telescopic masts and generator sets fixed on supports adapted to the type of machinery. For example, on a screed the support will be fixed to the traction ring so that it does not hinder the driver. B- On a finisher: the balloons will be connected directly to the 220V / 10A socket of the machine by means of an electrical interface. NB: In both cases A and B, we will be able to use our lighting system (Lumitube) fixed on the sides of the machinery at about one metre from the ground by means of their magnets and electrically powered in the same way. The choice is left to the client. Installation of a balloon light placed on its telescopic tripod, its generator-set placed in its holding tank against possible risks, provided with their absorbing felts. Special emphasis will be placed on the truck weighing / tarpaulin covering area. All our site technicians have received training from the VINCI safety managers (APTE'VA). Observe the general safety instructions on the site. Respect the environment (riparian, fauna, flora). Become acquainted with the action to be taken in the event of an accident and in the event of accidental pollution (information contained in the site's welcome booklet). nform the person responsible for general safety of any incident, accident or dangerous situation that occurred during the performance of the work. Participate in the joint prior visit and development of the risk analysis. Identify and store dangerous, sensitive (fuel) products in containment tanks and on absorbent material. Sort and remove waste from the site. 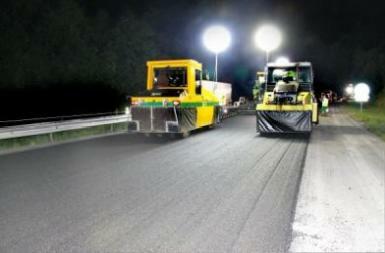 The site equipment and machinery must be in conformity, checked and maintained periodically. Drivers must notify management of any changes to the validity of their driver's license. For safety reasons, the use of mobile phones is forbidden when working on construction sites. Listen and respect the instructions given by the client. Ensure that the vehicles are equipped with their own lighting, flashing beacon, warning and reversing alarm (in perfect working order). Ensure that each vehicle contains on the dashboard as many information sheets and welcome booklet as technicians. Check that the auxiliary-fuel jerry-cans in the vehicle are properly installed in their rack, equipped with retention tanks and absorbent felt. Ensure, after receiving permission to enter the site to install the lighting balloons, that site safety is in place; each driver must ensure the lighting of their vehicle, warning lights etc. Position generator sets, telescopic masts and balloons in the places provided by the management and light them up as quickly as possible, remembering the retention tank and the absorbent felt. Special cases: if it is necessary to position the equipment behind the safety barriers on embankments or bridges, use the appropriate supports. Ensure during the night that no balloon light goes out and replace it if necessary. Be sure to refuel, without driving on the asphalt. At the end of the night, remove the equipment methodically after the people involved have left.